The Ultra-Sil View Dry Sack is a lightweight dry bag with a clear window and a round base that is intended for wet conditions where the bag will not be submerged. It is made out of a light weight waterproof fabric and is sealed shut by a roll top closure that is held in place by a buckle. The seams are double stitched and seam sealed. The clear window covers about a quarter of the bags circumference and most of the usable length. The clear window is fused to the cordura fabric in a way that looks secure and durable. 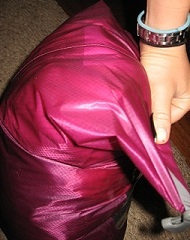 To use the dry sack, I place my gear inside, leaving several inches (many centimeters) of open space at the top. I remove extra air by flattening the top of the bag, and pressing out as much air as I can, and carefully rolling the top at least three times away from me. I then close the buckle towards me. If there is too much in the sack and it is difficult to close, I go back and repack the bag or remove items to make enough space at the top for an effective seal. One thing that I have learned is that most dry bags (including these) are airtight when sealed. This means that it is especially important to get as much air out of the bag as possible before sealing the top. Otherwise I find that the trapped air makes the bags take up extra space and can make them more difficult to close and pack. Overall these dry bags are exactly what I had expected from the pictures and descriptions on the manufacturer's website. The only thing that is worth commenting on is that when I hear that something is made out of "siliconized [...] nylon fabric" I always expect that the fabric will be sticky, regardless of the fact that I know from experience that siliconized fabrics are usually slick and sheer. The fabric for these bags is a nice, lightweight, medium weave fabric that is almost see through. It is slick and not at all sticky. The fabric is light but seems sturdy and durable for the weight. The purple is also a nice vibrant, but not-too-bright color. 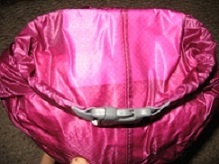 The seams and the roll top closure are well sewn and looks to be of quality construction. The window is made out of a fairly thick, pliable plastic and looks like it will effectively eliminate the "find my stuff" game that usually involves opening each of my dry bags multiple times because I keep forgetting what is in each sack. In normal stuff sacks this is not such a problem, but dry bags take significantly longer to open and reclose each time. This is because I must unbuckle the closure, unroll the top, look inside, then press the air out, roll the top shut, and rebuckle the closure. Compare that to the time it takes to open a normal stuff sack (by pressing a toggle, pulling away from the bag, looking inside, then tightening the toggle) and multiply it by the three to five bags for each search and the whole activity quickly becomes annoying. I am excited to be able to see the contents and skip the search altogether. Before each trip I usually check my dry bags for holes by filling the bag with air, sealing the top, and compressing the bag. If air leaks out, I look for the hole and patch it. Usually they are pretty easy to find when the bag is full of air. I did this test when I pulled the bags out of their packaging and found that both of the dry sacks I received were airtight. The manufacturer instructs me to avoid putting the bags in contact with abrasive surfaces or sharp objects. Also, when necessary, the bags should be hand washed in warm water. If these dry bags are used to protect sensitive electronics, the manufacturer recommends that two dry bags be used for additional protection. Also, the bags are not meant to be submerged and at least three rolls of the closure are needed to ensure a good seal. To determine the level of water protection of these bags I ran a few controlled bathtub tests. I filled each dry sack with a towel wrapped in newspaper. I then tested the water tightness in a couple different ways. I sprayed the bags lightly with water for 15 minutes (emulating a heavy rain shower) and found that the water beaded up and rolled right off of these dry bags. The contents remained dry and I could not detect any moisture in the bags, which was especially noteworthy along the seams and at the opening. I then let them sit in the bathtub in 2 inches (5 cm) of water for 2 hours (as might happen if these were used for boating). I found that after two hours the towel and newsprint were completely dry in both bags, but noticed a small amount of moisture in the top few inches where the top was rolled to create the seal (both on the outside and the inside of the bag). I made sure that I only rolled the top three times for this test, so in the field, if I expect the dry sacks to be sitting in standing water I will probably roll the top additional times. Over all I was impressed at the ability of these dry sacks to keep my gear dry. I am looking forward to using these on my trips this summer. The sizes look like they will work well for packing my backpacking clothing and soft gear. I will report on how well these fit into my backpack, their durability, and their ability to keep my gear dry. I will also pay careful attention to how the windows affect the use of this dry sack. In addition to these trips, I used the dry bags on day-long canoes trips, afternoon kayaking excursions, and day hikes in the rain. These dry bags performed very well in general. On my backpacking trip they were light, easy to pack into my backpack, and the window made it easy to see what was inside. I was careful to avoid placing the dry bags in contact with sharp objects or near abrasive surfaces and they remained waterproof throughout the test. They protected my gear from both rain and standing water and were easy to use. 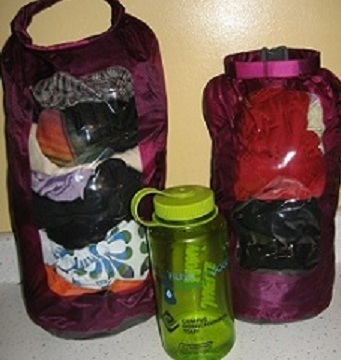 Packability: The windows in these dry bags made them very easy to pack so that the contents were easy to find later. I found that I preferred the 8 L size over the 13 L size because I generally like to pack my gear in smaller, easier to organize packages, and the 8L bags were easier to pack into my backpack and kayak. 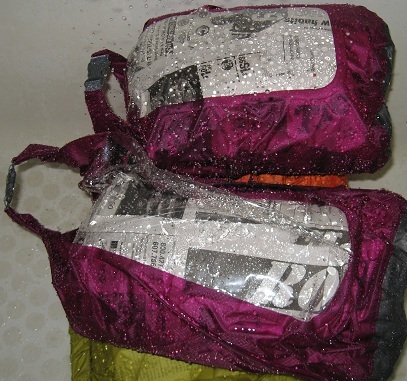 I found myself reaching for the 8L view over all of my other dry bags for these two reasons. I think that the usefulness of the window is worth the extra weight compared to non-windowed drybags made out of the same material. 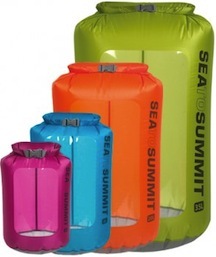 I really liked these dry bags and was impressed by their durability, weight, and usefulness for backpacking. The windows were amazing and held up beautifully throughout the test. I will continue to use these drybags for packing my clothing so that I can find what I need easily and have confidence that they will be dry no matter what conditions I encounter. Thank you to Sea to Summit and BackpackGearTest.org for the opportunity to test the Ultra-Sil View dry sacks.